From July 21 to 28 Prof. Sassmannshaus will teach a master class for international talents at the Musikhochschule Weimar, Germany. Apply now, Spaces are limited. On June 2 and 3 Prof. Sassmannsahus will teach two seminars at the 2017 Starling-DeLay Symposium at the Juilliard Schholl in New York. The first morning he will explain how to teach Paganini Caprices 4, 14, 17, and 24, with young artists performing and demonstrating. The second morning will focus on bow techniques. Prof. Sassmannshaus will teach and perform at the Innsbrook Summer Institute in Missouri from June 9 to 17, and at the Bowdoin International Music Festival in Maine from June 25 to July 15. The Quartet was formed in Israel sixteen years ago when its members were young students and have been playing together ever since. Recently awarded the prestigious Cleveland Quartet Award, the Quartet serves as the Faculty Quartet-in-Residence at the University of Cincinnati's College-Conservatory of Music, where they direct the chamber music program and perform their own annual series of concerts - a remarkable achievement for an ensemble so young. at New York's SubCulture that featured a midnight performance of the Grosse Fuge; a performance featuring music by three generations of Israeli composers at the Kennedy Center in Washington, D.C.; performances resulting from the Cleveland Quartet Award in Kansas City, Austin, and Buffalo; and a tour of South America. The Ariel also collaborated with the pianist Orion Weiss in a program commemorating the 100th anniversary of World War One. The Ariel Quartet performs widely in Israel, Europe, and North America, including two record-setting Beethoven cycles last season, performed before all the members of the quartet turned thirty. The Ariel continues to astonish with its performances of complete works by memory and has remained committed to performing extensively in Israel. In addition, the Ariel has collaborated with the pianist Orion Weiss; violist Roger Tapping; cellist Paul Katz; and the American and Jerusalem String Quartets. The Quartet toured with the cellist Alisa Weilerstein during the 2013-14 season, and performs regularly with the legendary pianist Menahem Pressler. Additionally, the Ariel was quartet-in-residence for the Steans Music Institute at the Ravinia Festival, the Yellow Barn Music Festival, and for the Perlman Music Program, and was the Ernst Stiefel String Quartet-In-Residence at the Caramoor Festival. Formerly the resident ensemble in the New England Conservatory's Professional String Quartet Training Program, the Ariel has won a number of international prizes including the Grand Prize at the 2006 Fischoff National Chamber Music Competition and First Prize at the international competition "Franz Schubert And The Music Of Modernity" in Graz, Austria, in 2003, when the Quartet's members were remarkably young. After they won the Székely Prize for their performance of Bartók, as well as the overall Third Prize at the Banff International String Quartet Competition in 2007, the American Record Guide described the Ariel Quartet as "a consummate ensemble gifted with utter musicality and remarkable interpretive power" and called their performance of Beethoven's Op. 132 "the pinnacle of the competition." 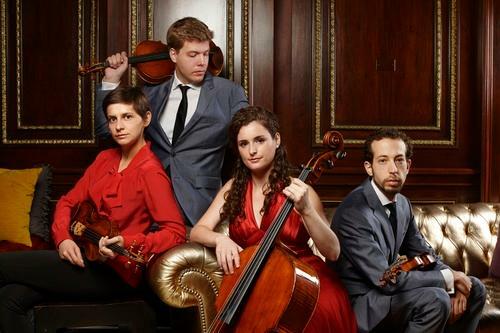 The Ariel Quartet has been mentored extensively by Itzhak Perlman, Paul Katz, Donald Weilerstein, Miriam Fried, Kim Kashkashian, and Martha Strongin Katz, among others, and spent a formative year in Basel, Switzerland, studying with Walter Levin, the founding first violinist of the LaSalle Quartet. The Quartet has received substantial scholarship support for the members' studies in the United States from the America-Israel Cultural Foundation, Dov and Rachel Gottesman, and the Legacy Heritage Fund. Most recently, they were awarded a substantial grant from The A. N. and Pearl G. Barnett Family Foundation. 2016-01-08 Join Us in Beijing July 2016! 2015-10-15 Prof S in Good Company!